Spring is upon us, and that means it’s time to get ready to get back to enjoying the beach, the coastal scenery, the food, and the festivals that make living in the Lowcountry a pleasure. But locals and tourists are discovering that outstanding live entertainment is fast becoming a part of that mix, and this season is sure to be one marked by a fast-rising, female-led group called Executrix. One of the founding members, Hannah Joy Brown, who plays guitar, bass, and sings in the band, said, “We are doing everything from classic rock to jazz and everything in between. We cover an array of music and make it fresh. Some of our personal favorites are Pat Benatar, Aerosmith, Brittany Spears, Taylor Swift, Tom Petty, Joan Jett, Melissa Etheridge, and Maroon 5. We even do a Nancy Sinatra song!” The band also writes and performs original music. Brown, 18, was born in Maine and has been living in Bluffton for almost five years. She’s a senior at the SC Whitmore School, a virtual charter high school. Her musical influences include female rockers and men that can hit the high notes. In addition to commercial musical influences, one of her personal mentors and favorite local musicians is J. Howard Duff, a Bluffton rocker and music teacher who has played with Bruce Springsteen and Chuck Berry. His bands, Metro Blues and Flashback, frequent the Lowcountry. Learning to play guitar is what gave her the vehicle to accompany herself and begin to write her own songs. Brown said, “Through my songwriting, I’m giving voice to the annoying, painful and crazy things we all sometimes go through. I love it when someone hears something I wrote and says, ‘that’s exactly how I feel!’” Brown has been performing since the age of four in musical theater; she attended Brevard to study opera, and has had classical vocal training. Since childhood, her only desire has been to perform. “Music is a rush. It makes me feel alive,” Brown said. Although Brown is the front person for Executrix, the band is very much a group effort. For example, co-founding member, Chris Glick, 18, is the drummer and the easy-going backbone of the band. A gifted lyricist, Glick was born on Hilton Head Island and is a senior at the same virtual charter high school as Brown. He’s been playing drums since age 11. Over the past seven years Glick has been involved with classic jazz, hard rock, and heavy metal. Matthew Spruill, 21, is the bass player with crazy good hair and an amazing smile. Born in Seattle and raised in South Carolina, Spruill is the newest band member. He started playing bass at age 14 when his friends wanted to start a band. After graduating Thomas Heyward in 2013, and after having some success with his former band, Spruill got the opportunity to join Executrix while working at the Mellow Mushroom in Bluffton. He soon became a welcome addition who not only plays bass and guitar, but is also an accomplished singer and songwriter, influenced by John Mayer and Jack Johnson. Spruill credits many of his lyrics to his varied life experiences and encounters with interesting people. 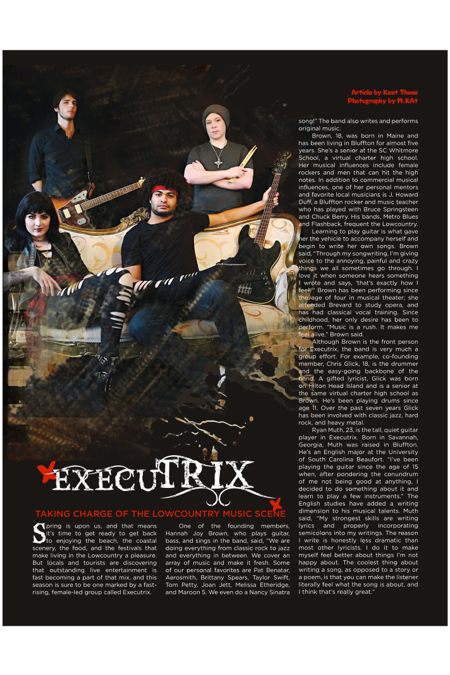 It will be hard to miss Executrix this spring and summer around Beaufort County. The weekly gigs the band has secured over the summer are The Boardroom, Fat Patties in Bluffton, and Jamaica Joe’s at Hilton Head Island Beach and Tennis, with more in the works. The band also plays gigs at The Old Town Dispensary, R Bar & Grill, The Dirty Martini and open mic on Tuesday nights at Corks in Bluffton. When the summer season is winding down, members of Executrix will expand their horizons with a September 2016 move to Nashville, where they will share their talents with “the little big town” known as Music City, USA, and hopefully with the rest of the world. What might make Executrix rise from the Lowcountry to higher places? Perhaps it will be the same qualities that make them unique—a dynamic band of characters with a take-charge female leader and a combination of eclectic songs. Or it may be the personal bond that takes them to the next level. “We like to spend time together outside of gigs and rehearsals. We are a family,” Brown said. Kent Thune is a musician, philosopher and a freelance writer who happens to be a money manager and the owner of a Hilton Head Island investment advisory firm, Atlantic Capital Investments. He is currently working on a book to be published later in 2016. You can follow his musings on mind, money and mastery of life at TheFinancialPhilosopher.com or on Twitter @ThinkersQuill.